Robin Olds arrived in Europe joining the 479th Fighter Group in May 1944 flying Lightning P-38Js and Mustang P-51Ds. He became an Ace within 12 weeks of his arrival and by the end of the war, now commanding the 434th’s P-51 Mustangs, he’d flown over 100 missions and scored 24 victories, 13 in air-to-air combat. 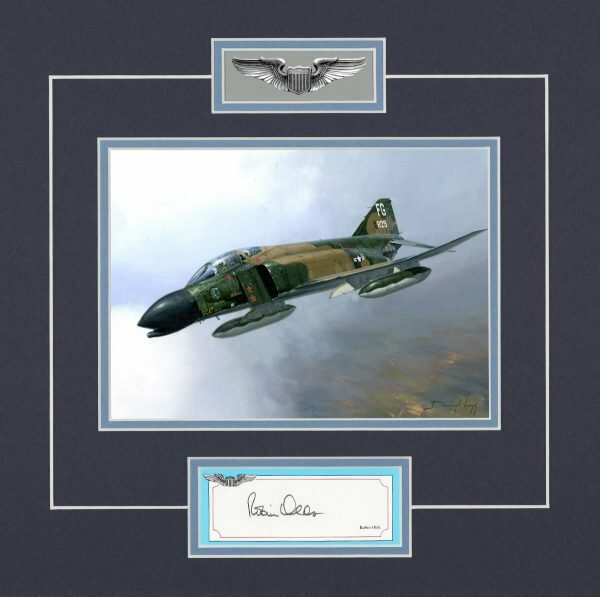 Years later, during the war in Southeast Asia where he completed 152 combat missions, Olds flew McDonnell Douglas F-4C and D model Phantoms on some of the most gruelling missions of the war – including his famous “MiG Sweep”. The citation for the third Oak Leaf Cluster to his Silver Star was awarded for “exemplary airmanship, extraordinary heroism and indomitable aggressiveness” in the epic low-level bombing raid on the Thai Ngyen steel mill blast furnaces. He was later was awarded the Air Force Cross for his part in the Famous Paul Doumier Bridge raid.